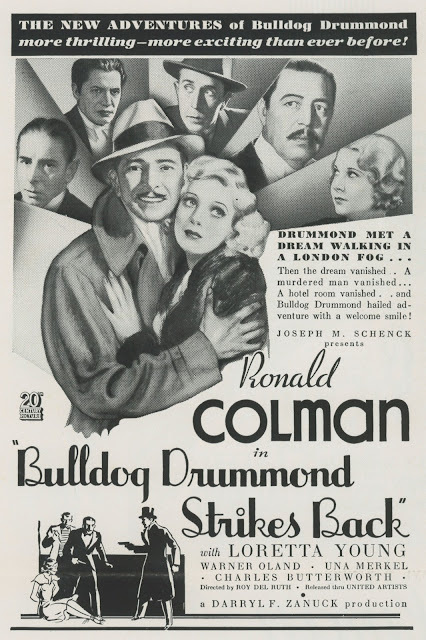 BULLDOG DRUMMOND STRIKES BACK (1934) --- Freewheeling gentleman sleuth Ronald Colman in the second of what I wish had been a longer series that unfortunately ended here, at least insofar as Colman's participation. 30's mystery goes down easiest on light setting. The best of them are all about personalities, or should be. Footloose RC relies on his charm, of which there's plenty. Strikes Back reminded me of The Devil To Pay of a few years earlier, being undistilled Colman as most prefer him. No lost love or march to the guillotine here. Bulldog's mystery is not one the cast takes seriously, its solution apparent from about mid-way, getting there and beyond being multiple levels of fun. 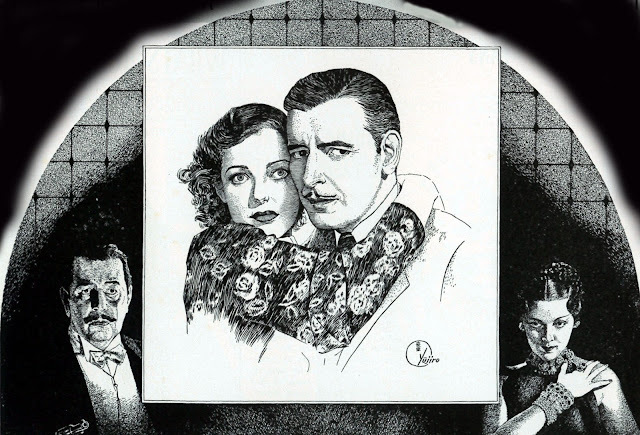 Villainy is supplied by Warner Oland. I read how he showed up often not knowing the day's dialogue. Maybe actors now should follow that example given results WO got with it. Oland v. Colman is a thespic dream match. You could wish detecting Drummond had gone over to Fox in the wake of Strikes Back and teamed with Charlie Chan. 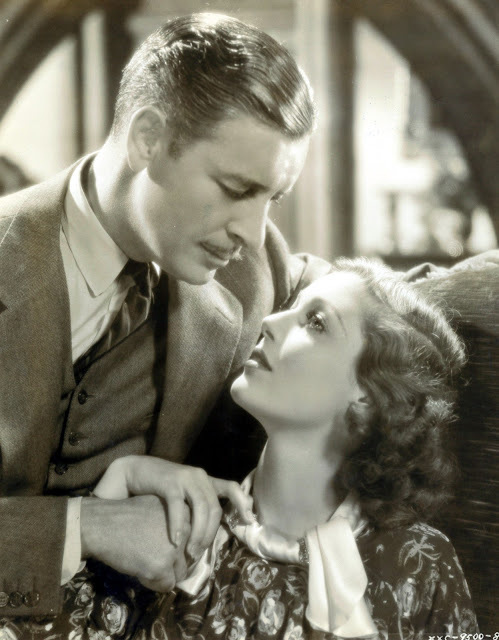 This one seemed precode, even though it wasn't, what with foolery arising from Charles Butterworth and Una Merkel's unconsummated wedding night. Danger is real enough to keep Strikes Back out of outright spoofing's way, but barely so. What a shame this isn't legit-available. Some underlying rights snafu, I assume, and who'll spend the $ clearing it? One of the best 30's pics we can't see, except boot-wise. MEN IN WAR (1957) --- The grim business of getting to, then taking, a Korean objective one foot and casualty at a time. Men In War was said to have cost indie filmmakers (for UA release) less than a million, dirt roads and Bronson cavern subbing for Asian peninsulas. 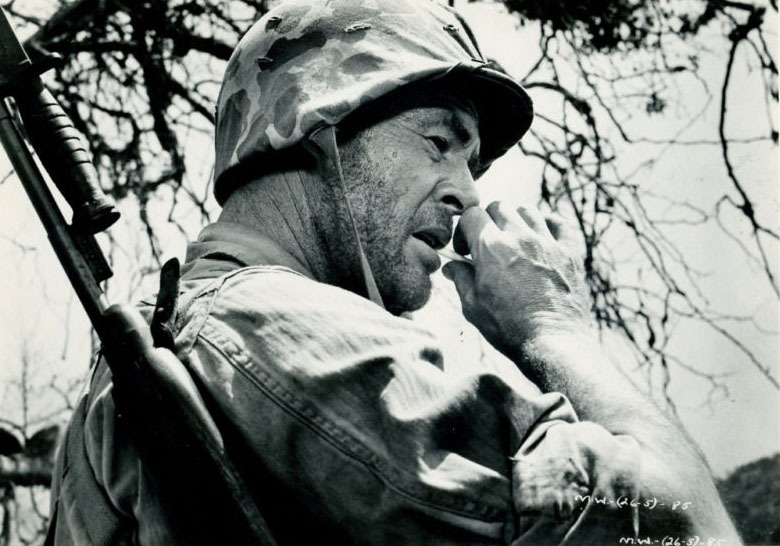 For its simplicity and avoidance of combat formula, this may be a purest of manhood rituals director Anthony Mann addressed over a decades-long career. I'd guess he had more freedom here than with big studio westerns done around a same period. Men In War's writer (Ben Maddow) went on blacklists and so was not credited. Players I like do strong work: Robert Ryan (in for a % of the pic), Aldo Ray, Robert Keith (one word of dialogue as a shell-shocked officer, and great), James Edwards, Vic Morrow ... there's also Tony Ray, director Nick's son of le affaire Gloria Grahame fame. Men In War padded someone's purse, with $1.3 million in domestic rentals, another $1.3 foreign --- this was one independent venture that paid off. 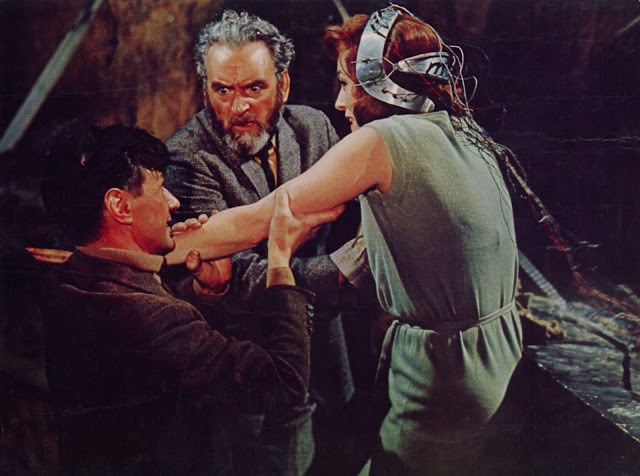 FIVE MILLION YEARS TO EARTH (1967; US released in 1968) --- Hammer films, at least around me, had stopped drawing crowds by 5-11-68 when I saw this with The Viking Queen, Brick Davis and myself feeling quite alone at the Liberty. Distributing 20th Fox was little more engaged, their pressbook for Five Million Years To Earth less substantial than a cocktail napkin. The fact it's among best of that era Hammers mattered little for eroded enthusiasm for their brand (Five Million got a paltry $306K in domestic rentals). Co-feature The Viking Queen was maybe more to liking of whatever other fourteen-year-old boys were that day in Liberty attendance. 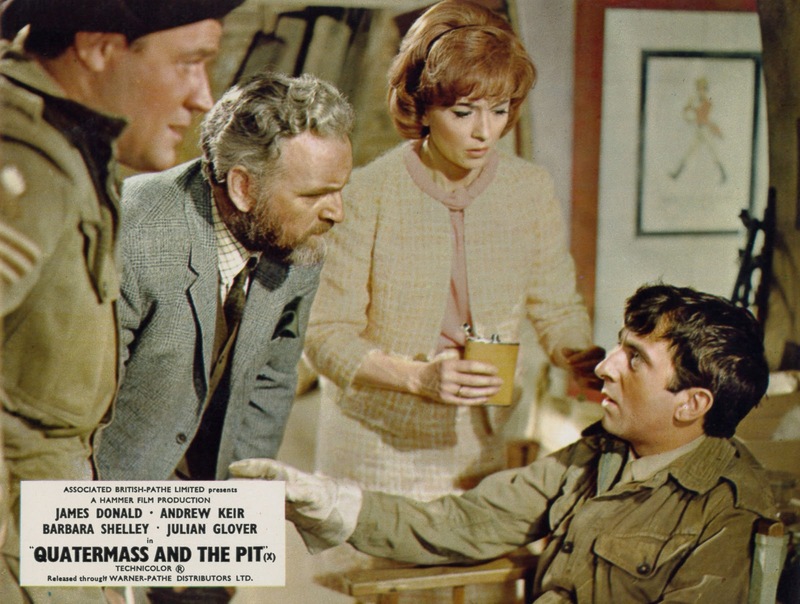 Five Million Years To Earth (UK released as Quatermass and The Pit) served a deeper dish than I could fully grasp at the time. It's actually taken a number more viewings to catch up with startling ideas put across here. Hard to believe something so literate played initial dates to mostly children. Many towns had it only at drive-ins, a further barrier to committed concentration Five Million deserves. Seen on a crackerjack Region Two Blu-Ray that I'd highly recommend. 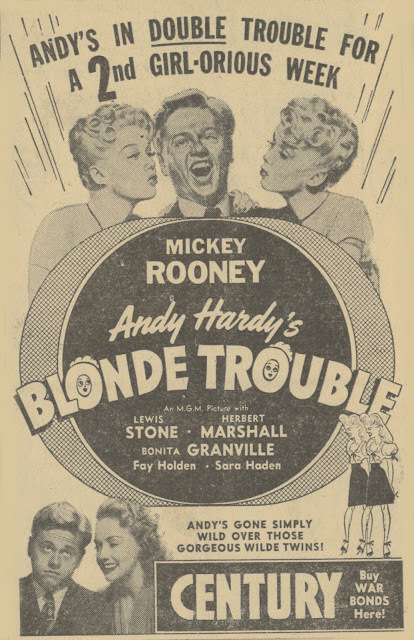 ANDY HARDY'S BLONDE TROUBLE (1944) --- Andy headed off to college really amounts to splitting up the family, so there is back-and-forth between him on campus and fairly tepid happenings back in Carvel (making us realize how much the Hardys needed Andy). Surprisingly long for a Hardy, Blonde Trouble puts both Andy and his audience in unfamiliar surroundings. What helps is novelty of the Wilde twins (both still with us) and suddenly grown up, even though she plays a freshman co-ed, Bonita Granville (one thing startling about teens in 40's pix is their stylish and mature dress --- I could happily go for any of Andy's suits). Dr. Keye Luke drops over from Blair General to treat Judge Hardy for tonsillitis, a neat melding of two entrenched MGM series. The Hardy franchise was here at a turning point. How could they continue with Andy away four years to college? And what of his service obligation, with a country now at war? (scenes addressing this issue were shot, then jettisoned) Andy and Carvel would never be the same after Blonde Trouble. One more in 1946, Love Laughs At Andy Hardy, couldn't revive the brand after two-year break of momentum (and Rooney's own service hitch). 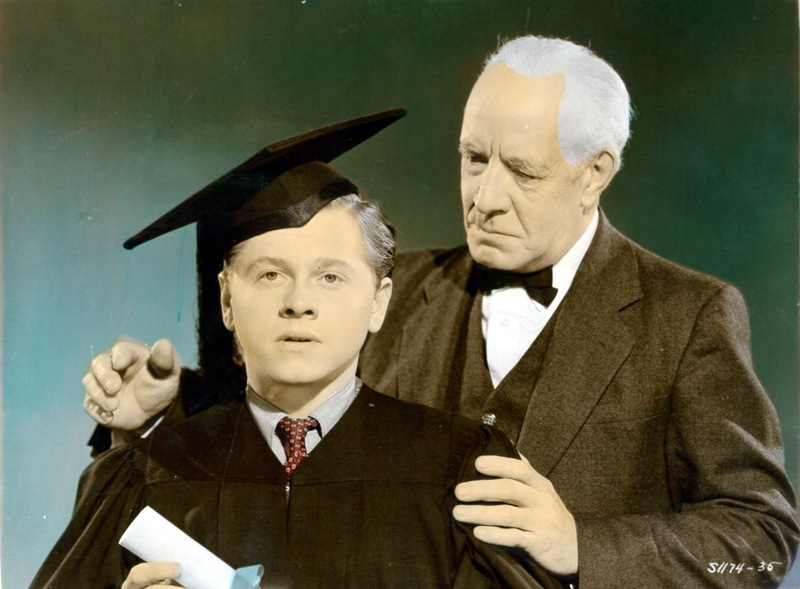 Worse would be Andy Hardy Comes Home, which he shouldn't have, in 1958. A most surprising aspect of Blonde Trouble is college dean Herbert Marshall, who flirts with possibility of romance with student Bonita Granville, a concept far more daring now than it would have been in 1944. Seen on TCM, though Blonde Trouble is bound to show up with Warner Archive's next Andy Hardy wave. 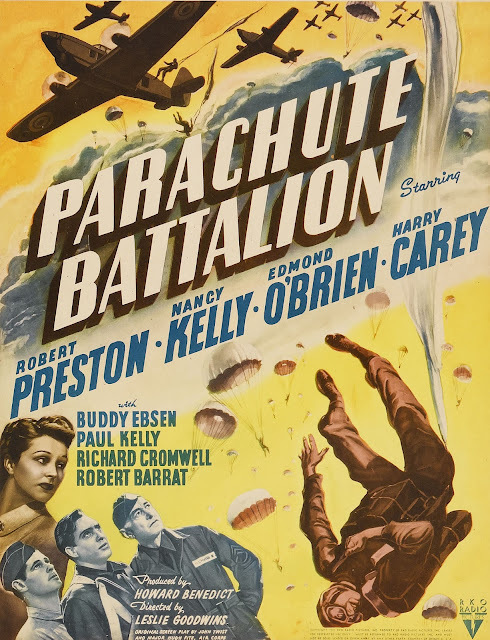 PARACHUTE BATTALION (1941) --- This was sold by RKO to 1941 exhibitors in the same block with Citizen Kane, but unlike Kane, came back with a profit. Parachute was exactly what audiences wanted as the country drifted closer to war. True, it doesn't amount to much, but soldiers in training were focal points of interest for families facing membership thinned by a peacetime, and soon to be wartime, draft. The story is mere backdrop to training footage, with boys making first jumps out of aircraft. War isn't mentioned, but it's clear that's where they're headed. Edmond O'Brien looks younger than he would again, a handsome boy who'd be immortal as an agitated character man, and Robert Preston is recognizable mainly by his voice. Welcome Harry Carey plays a grizzled sergeant. Viewers who'd known his westerns since childhood must have been reassured to know HC stood still ready to serve. There's no combat here, just camp conflicts, more of them romantic than military-related. A fairly rough print seen on TCM. Warner Oland was always INCREDIBLE, and even better when sober. There's a scene in CHAN AT THE RACE TRACK shot right after lunch one day. The folks in charge of monitoring Oland during the eating break dropped the ball, and WO returned to the track (they were on location)as drunk as Huck Finn's Pap. They had to get the shot, so they positioned Warner in the middle of a bunch of extras who literally kept the star from falling down. The shot is in the finished picture. Warner Oland was a great actor and the Charlie Chan films were just never the same after he died. Oland, who was from Sweden, really did look oriental. Keye Luke said in an interview that he never wore any make-up as Chan except for the tiny beard on his chin. 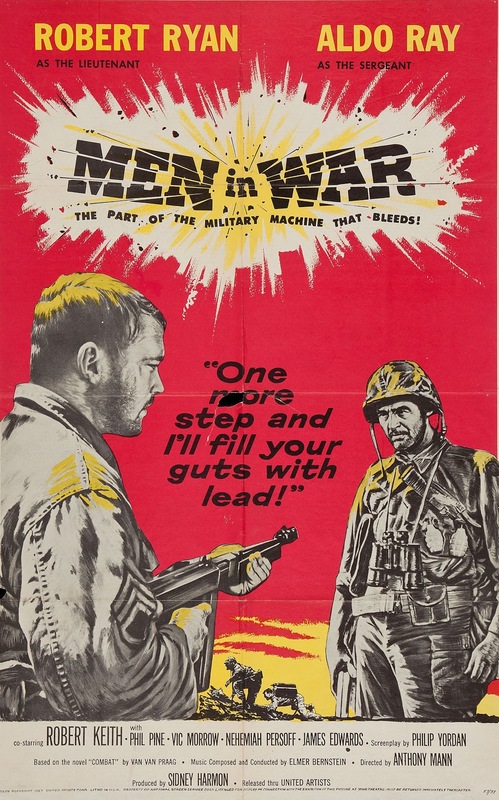 I love the movie round-ups on so many forgotten gems like "Men At War". On "Andy Hardy Comes Home" (1958) Ann Rutherford turned Mickey down to return as Polly Benedict, saying you can't go home again. 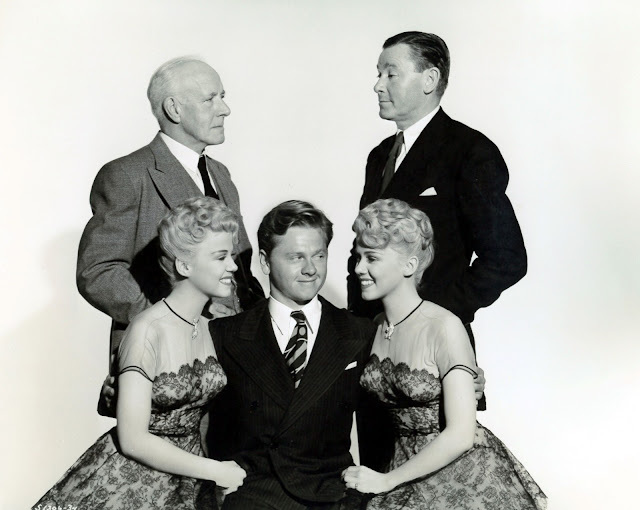 Mickey Rooney was probably hoping for a new "Hardy Family" television series. I wonder how many Brits who watched FIVE MILLION MILES TO EARTH got an extra case of the willies from the movie's set design, far below ground beneath the streets of London? Did any of them have flasbacks from WWII, when thousands of the city's residents sought shelter from nightly blitzes of Hitler's Luftwaffe in the tunnels of the "tube"? Little did they know that twenty-five years later a plague of giant alien grasshoppers would be hatching out in the place that had once offered them refuge. Another nice bunch of half forgotten titles! I'm afraid Bonita Granville is just about the only thing that could lure me back into Andy Hardy territory. Never could connect with that series, and have never even bothered with this particular entry. But as I suggested, I'd watch the wonderful Ms. Granville in ANYTHING. Either as a spiteful little devil or a goody two-shoes, she always managed a layer of recognizable believability. FIVE MILLION YEARS TO EARTH! One of my faves, and I caught it first run at a local grindhouse double feature (can't seem to recall what the other movie was). Haven't seen it in a couple of decades, will have to snag that DVD! Another vote for Bonita Granville! What a charming presence she was in everything, whatever kind of role. Bonita became a pretty good TV producer, too. Don't get all the Bonita Granville love. Never found her charming or attractive. And when she played bratty, she usually overdid it. The one Granville performance I enjoyed came late - as a sideline tramp in the terrific Belita-Barry Sullivan noir "Suspense"(1946). A DVD Savant review from a few years back described the impression she made in that film perfectly - "a bad news Betty Grable". Recently heard the Lux Radio version of "These Three", the excellent film for which Granville was (over) rewarded with an Oscar nomination. The radio version retains the two actresses who were best-in-show in that film (Marcia Mae Jones and Alma Kruger) and offers heavyweight replacements for the rest (Mary Astor for Merle Oberon, Errol Flynn for Joel McCrea and Barbara Stanwyck for Miriam Hopkins). Best of all the Granville character's played by the marvelous Helen Parrish, fondly remembered as Deanna Durbin's nemesis in a couple of 30's films. 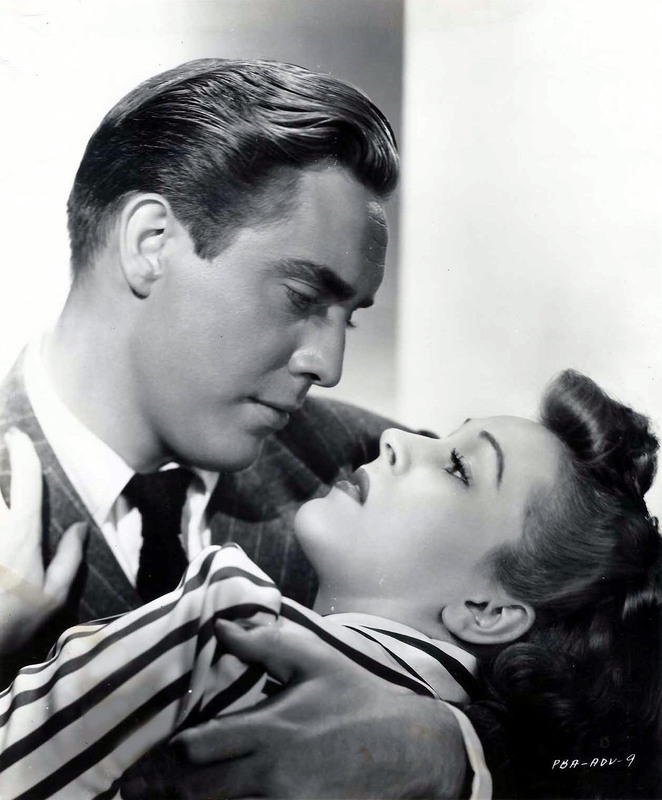 Her performance in 1939's FIRST LOVE is a mean-girl masterclass. Aside from being very very pretty, Parrish was equally adept at playing nasty and nice. She really deserved a bigger career. Back in the late 1970s, William K. Everson would come to The Film Center in Chicago to show titles from his private collection. 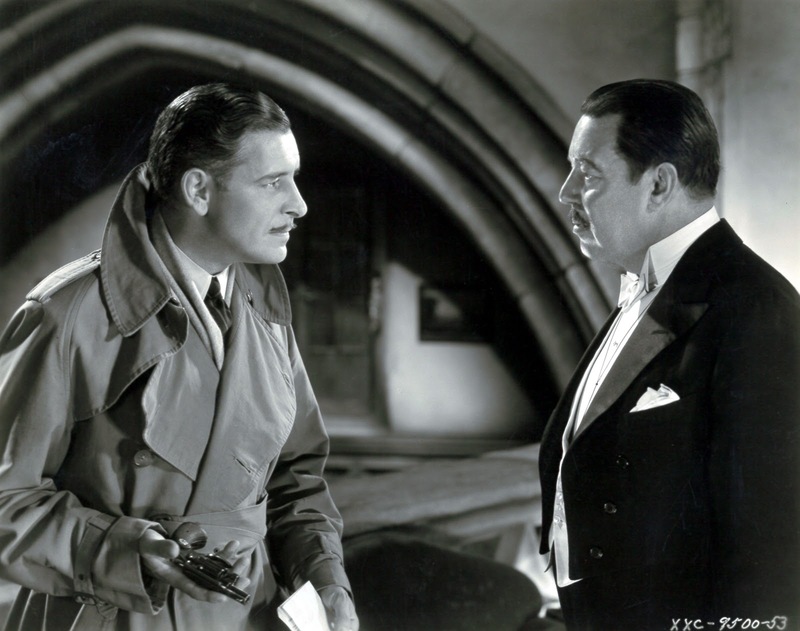 One year he screened a beautiful print of "Bulldog Drummond Strikes Back" to a large and enthusiastic audience. It's an absolute delight and I remember telling my dad afterwards that it was a 1930s film I would have no problem sharing with my friends (I was in high school at the time). I would love to see it again. I don't remember much about it except the immense pleasure it gave me, and I suspect, everyone else in the audience. The applause was long and sustained. Bonita Granville as Nancy Drew is a hoot, hamming it up at top speed while Frankie Thomas as Ted is a bit more realistic, barely tolerating her energy. He seems to be thinking, "Last time she put me in a boxing ring and now I'm in a dress. She's hot, but is she THAT hot?" Favorite moment in one film has Ted as an iceman, happily flirting with a giddy housemaid and clearly getting further than he ever did with Nancy. Miss Drew comes down like the Wrath of God, equal parts jealousy and snob. Bonita Granville may have come down like the Wrath of God in 1941, when Warners announced that she would be starring in a new series of Nancy Drew mysteries... in two reels each! It appears that the announcement was made before the actress was consulted; she didn't go for it, and plans for the mini-Drews were scrapped. I recall seeing FIVE MILLION YEARS TO EARTH at the Armitage Theater here in Chicago on a triple-bill with THE VIKING QUEEN and HERCULES UNCHAINED. Looking back, I'm surprised that at six years old, I was able to sit still for three flicks in a row. FIVE MILLION YEARS TO EARTH definitely had the greatest impact on me that afternoon; scared the heck out of me, and when I started feeling ill that day (turns out I had the flu), I blamed the movie for "scaring me sick"! One of the outstanding features of the film is all those weird sounds. 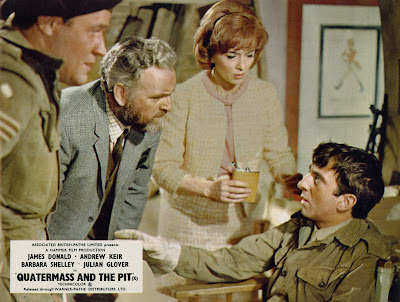 I've recently acquired the dvds of the six-part BBC QUATERMAS & THE PIT, so it should be interesting to compare the two.